Once again International Music Magazine brings there supporters Issue number 5 Block Runner Edition with some of the hottest hip-hop and independent artist from around the world. 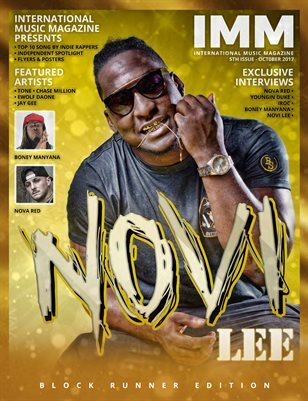 South Carolina's own Novi Lee blesses the front cover and other artists in the issue such as Jimmy Lee,IRoc,Nova Red, Boney Manyana,Youngin Duck, and an interview with Novi Lee about the passing of his good friend and partner Lewis Jones. Support good music and get your copy of IMM!